What does circular needle for “magic loop” mean? Magic loop is just one of the methods that can be used for knitting in-the-round for small circumferences. It is the method I use, but there are many other valid methods. The magic loop method uses an extra long circular needle. In-the-round small circumferences can also be done with double pointed needles and with several other methods that can be found on the internet. I’m curious, why do the crown patterns vary so much between hat sizes? I know the rib knit is pretty forgiving size-wise, but I’m trying to modify the pattern to accommodate for a very very large hat (head circumference 25″) and my own very tight knitting gauge. The sizes vary by 6 stitches, but the crown reductions are 12 stitches, so the in-between sizes have to have a special 6 stitch crown reduction row. 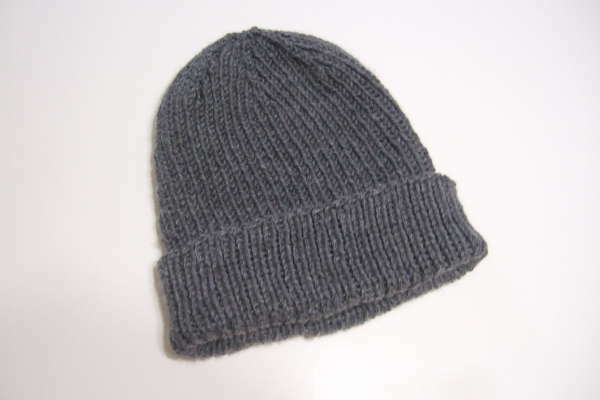 Because of the rib pattern, the type of reduction stitch is different depending on if it occurs over a k-p-k, a p-k-p or a k-k-k.
Hi I would like to make this hat, but using worsted yarn instead, and then I’ll have to use 3.5 mm circular needles. I am unsure how to adjust the pattern. I know I’ll have cast on more stiches, but I’m unsure how many? What will your gauge be? I was wondering, is it possible to make crossed (x) shaped crown out of it as well? I work with 84 cast ons. I just don’t want to make a mistake! You will make this set across the round four times. I am starting the crown for medium adult size. When I started I counted 102 stitches before I started the crown. I somehow was left with 2 stitches at the end of the round? Any ideas what I may have done wrong? You should have 3 s2kp2 stitches on that round. Each of the s2kp2 stitches uses 3 stitches and results in 1 stitch, therefore reduces 2 stitches each. The three of these would then reduce 6 total stitches on the round, so beginning with 102 stitches should reduce to 96 stitches. I’m just starting the crown on large adult and I’m not a real experienced knitter so please bear with me. I’m confused on the first round. I’m starting with 108 stitches and using two double pointed needles with 54 stitches each. If I do that same pattern all around I end up with 90 stitches and not 96 so I’m putting too many s2kp2’s in there and I’m confused as to how to space this out. Any help is greatly appreciated. Thank you. It does sound like you have too many s2kp2 stitches. You should have 6. After making the first s2kp2, you have (k1, p1) 4 times and then have (k1, p1) 3 times, k1 before making another s2kp2. My adult daughter wants a knitted hat like this one, but the magic loop really confuses me and I don’t want to sew a back seam. Is there a way to knit this hat in the round using circular needles, but not the magic loop? I really do appreciate your help! 1. Knit the body on a small circular needle and use double pointed needles in the crown once the circumference it too small for the circular. 2. Knit the body on a small circular and convert to flat knitting when the crown is too small so that there is only a small seam in the crown. This is the best hat pattern ever! For those who need to learn knitting in the round with a magic loop, there are many videos on youtube that demonstrate this. Watch a few from different knitters. Some are better than others. It’s amazing, and makes knitting in the round sooooo easy! THANK YOU for sharing this pattern–I have tried over a dozen online patterns, and this one is by far the best. I’m making a Teen size 90 co stitches. I’m an experienced knitter but can’t figure out the first decrease row. So I knit k1p1 ten times then k3tog then 1 purl, then k1k2, 3 times for a total of 20 stitches worked but after the k3 tog ends up being 18 stitches. I only able to do this 3 times with 10 extra stitches left at the end. This whole series is repeated 3 times for the round which uses the original 90 stitches and results in 84 stitches. Hi, if I started with a cast on of 100 stitches, can I use the decrease pattern for the Adult M size and just be left with less stitches at the end? You can do that. Another option is to use the newborn crown. For the newborn size it’s repeated 6 times on each round. For 100 stitch original cast on it would be repeated 10 times.